Everything seems to be gearing up nicely for the opening of Newcastle’s Clas Ohlson store, just two weeks today on Wednesday 24 August. 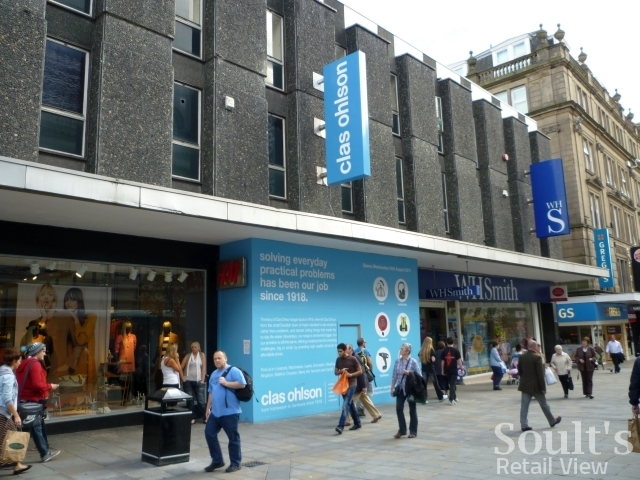 The Northumberland Street store’s hanging signage (below) has now been in place for a week or two, and there seems to be a big marketing push going on to build local awareness of the Clas Ohlson brand. Out and about on Monday, I spotted at least two billboards (in Gateshead) and posters at various Metro stations, including Jarrow, below. 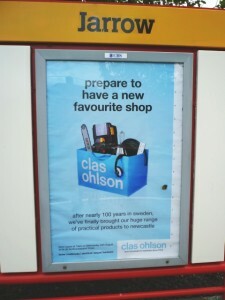 Under the tagline “Prepare to have a new favourite shop”, the posters emphasise Clas Ohlson’s range of “practical products” as well as celebrating the retailer’s Scandinavian heritage. 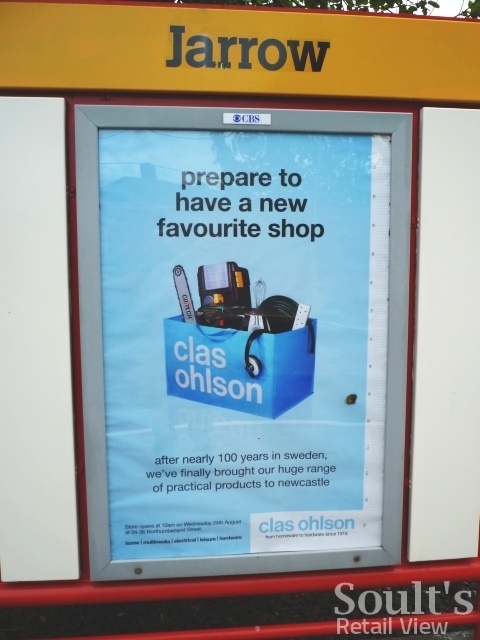 As a relatively new entrant to the UK market – Newcastle is its twelfth store – Clas Ohlson’s need to raise awareness and understanding of its brand mirrors the position of the US electronics giant, Best Buy, which currently has 11 UK sites. When I’ve mentioned Clas Ohlson’s arrival to people I know here in the North East, most have never heard of the chain; however, with the nearest store currently in Leeds, that’s hardly surprising. While the hoardings around the site have been prominently plugging the store’s imminent opening for the last couple of months, there’s clearly a job to do in telling Newcastle shoppers about what Clas Ohlson is – especially as the store’s lower-ground-floor location (previously occupied by Collectables) will make it more challenging than usual to attract unknowing people in off the street. Best Buy recently began a nationwide TV campaign on the back of launching its transactional UK website late last year, and this activity has potential to drive multichannel traffic, encouraging visits to the online store, big-box locations or both. Clas Ohlson, similarly, has been building up its physical store presence ahead of launching its online shop, which, according to its website, is set to go live early next year. 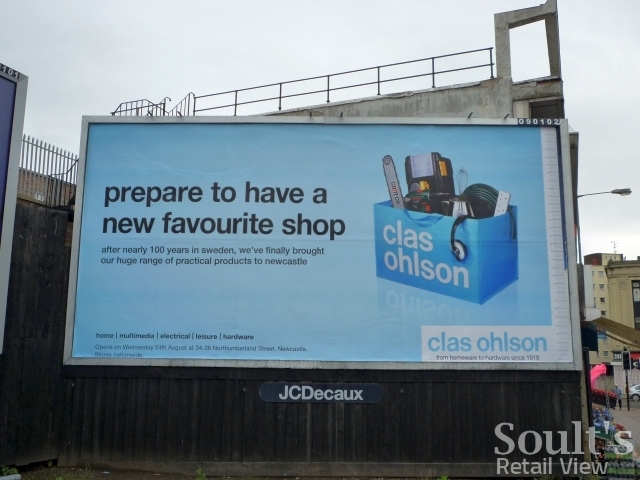 Being able to reach customers anywhere in the UK will be a critical stage in Clas Ohlson’s penetration of the British market, and, like with Best Buy, will make it worthwhile marketing the brand at a national as well as a local level. The hope will be that traffic to the physical and online stores reinforces one another, as well as potentially paving the way for further high-street store openings through 2012 and 2013. 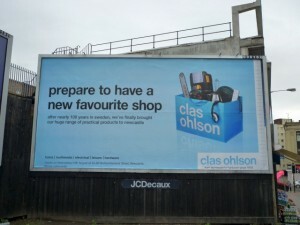 For now, Newcastle is set to be Clas Ohlson’s only UK store opening of 2011, but the launch of the online store in 2012 should ensure that shoppers elsewhere – be it Bristol, Southampton or Glasgow – are more clued up in advance should a Clas Ohlson eventually set up shop on their high street. Visted the Leeds store don`t thing any thing of it, it had opened been open 2 weeks and went in on a Thursday but only 2 other customers in the store, and only looking didn`t look to be buying, expensive people these days will look but end up buying in local outdoor market, cheaper. Can`t see it last. Just visited your new shop which opened in Newcastle upon Tyne yesterday 24th it was packed all day some great bargains staff very freindly and most helpfull Welcome to Newcastle hope it continues. 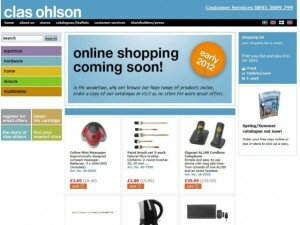 Hi Derek, this site isn’t affiliated to Clas Ohlson, but I know that Clas Ohlson’s people do read the blog and will be pleased that you enjoyed their store! Called into the Clas Ohlson branch while stopping off in Leeds a few weeks ago and found it to be a more spacious store than the one at MerryHill,Dudley. Altough I must admit that the store wasn’t exactly buzzing with customers considering it was a Saturday morning. Speaking to the guy at the checkout he said that the new staff for the Newcastle store were due at Leeds anytime for induction training. It was very quiet when I was there too. Will be keeping an eye on how the Newcastle store performs!